In this busy world where we work and play hard, it can be all too easy to fall into bad habits in life. But when it comes to parenting there are no second chances. What we do now can affect our children for the rest of their lives, so its important to make the most of this time. This week we’re looking at ways to be more present for our children, and sharing some tips on being a mindful parent. What does it mean to be a mindful parent? Being a mindful parent means being present in today. Being there for your child and being able to respond to your child without distractions. Being a mindful person requires a level of self understanding; to be a mindful parent we are required to understand our children. This can be done! Conscious parenting is so much more in reality, and it’s not always easy to get it right – but that’s ok. 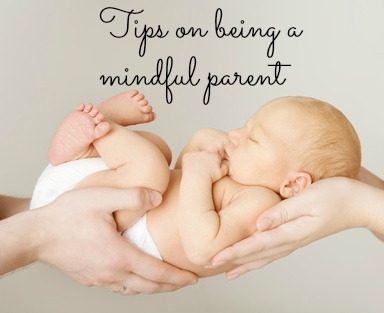 Being a mindful parent means growing and developing as your child grows and develops. Parenthood is a steep learning curve, but that doesn’t mean it’s impossible! Here are some tips that might work for you. By this we mean, approach each situation with your child with intention. Re-create your world when your baby is born, and make sure your re-creation is a child friendly version. Now that you’ve decided to be a parent, you may have to make sacrifices and self improvements too. Often parenthood is a huge job with no salary- you have to really want to do it! Approach it with positivity and good intentions… and prepare to learn as you go along. And if part of being a mindful parent is also being a mindful person, be aware of your own strengths and celebrate them in your parenting journey. Being a mindful parent means keeping your child in mind at all times. Listen to her and respond accordingly to her needs. You are your child’s biggest advocate and it’s up to you make her feel safe, secure and loved. This will come naturally, so don’t panic! This is not a difficult task- this is your calling! When you listen to your child and understand what she is communicating, you are able to better respond and strengthen your bond. Part of being a mindful parent is making informed choices, and this doesn’t mean avoiding all advice or throwing all the parenting manuals in the bin. Instead, take time to read up on any issues you’re experiencing, and be open to advice and guidance. Bear in mind that your child is an individual and that you are responsible for her guidance in the world, but that doesn’t mean you have to go it alone! Think carefully about the big decisions that matter a lot to you and your family, and keep your child’s best interests in mind at all times. We all need a little support now and then, so don’t feel you need to close yourself down. Being a mindful parent means being an instinctive parent, and our instincts can be the most powerful tool we have. With the knowledge you gain from understanding your child and reading around, your instincts will quickly be your go to when you need to make a decision quickly. Follow your heart. Remember parenting is a journey Just as life is not a goal but a journey, parenting is the same. Don’t set expectations on your child and hope for certain results within a certain time frame. Accept that this is a journey, and it will last for the rest of your life! Go with the flow where you can, and appreciate the small bumps and twists when they arrive. And most of all, enjoy the ride. Your role in this wonderful journey is to nurture, nourish and protect. Accept your child for who she is. Make room for your child in your life, and be grateful for the changes that come your way. Parenting is one of the most rewarding jobs you can have in your lifetime and it’s up to you to make the most of it. So switch off your computer, put your phone away and be there in your child’s life for an extra hour a day. You are guaranteed to enjoy it, and one day you’ll look back on all the memories you made with a smile on your face.